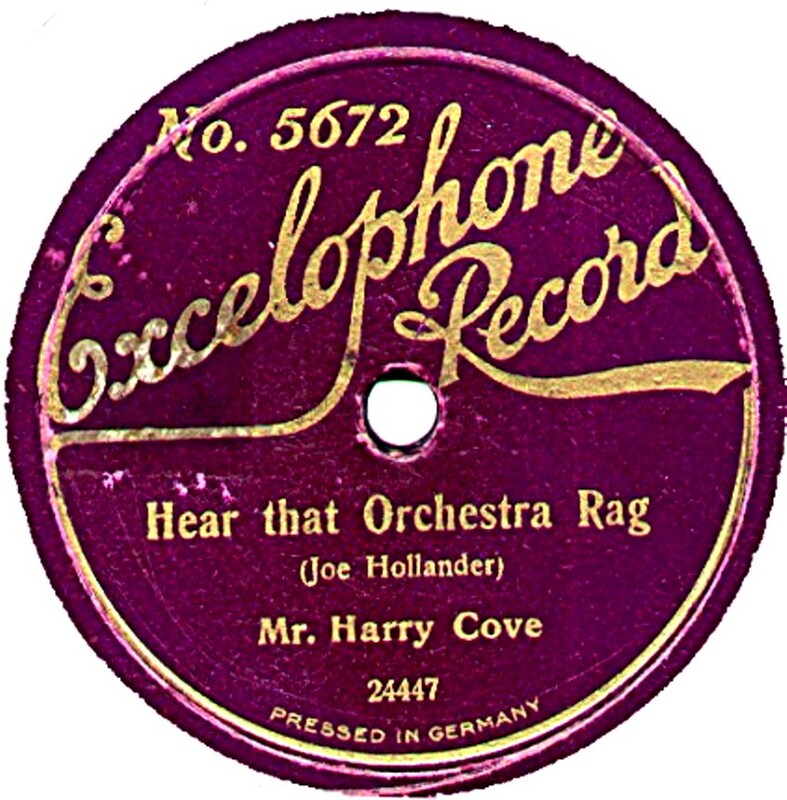 British 78rpm record labels whose name begins with E. Using the letter links below you can see pages for other letters. 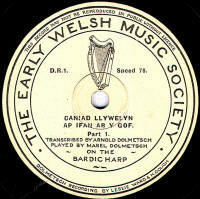 Early Welsh Music Society These records date from early 1937. They were produced by Dolmetsch Recods (q.v.) and there were three records numbered DR 1 to DR 3. 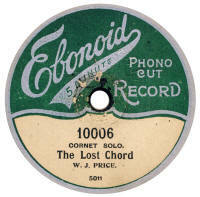 Ebonoid This was a vertical-cut disc produced by the Clarion Record Co just before WWI. They were long-playing (5 minutes each side) but short-lived, their catalogue numbers starting at 10001 and finishing at 10006. Price was 3/- each. 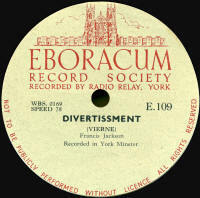 Eboracum Record Society Eboracum was the Roman name for the garrison at York, so not surprisingly, this society was based there. 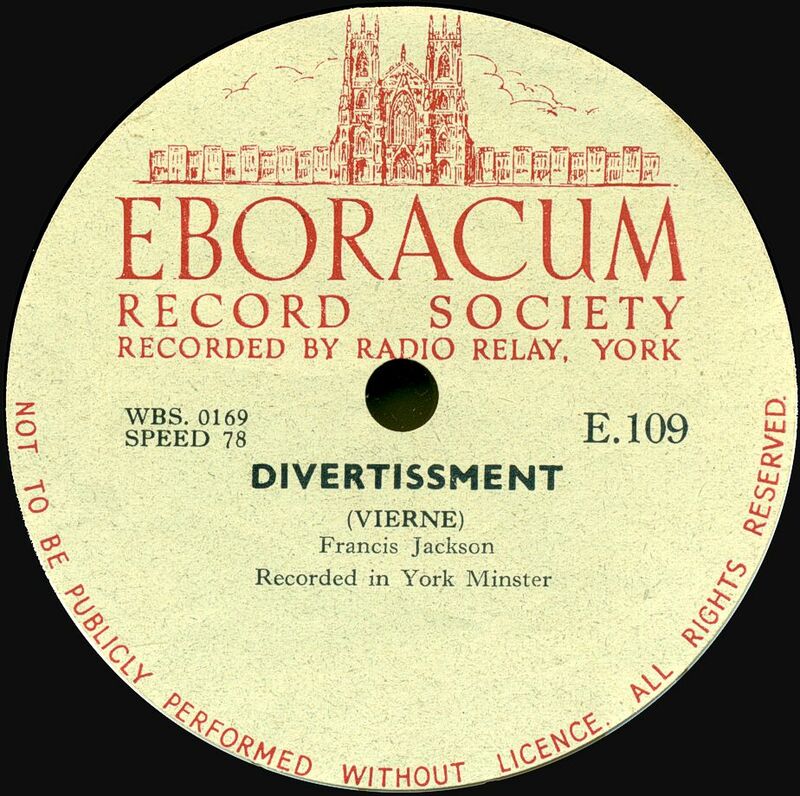 The Eboracum Record Society is thought to have been formed in the mid-1940s specifically to record the organ in York Minster. 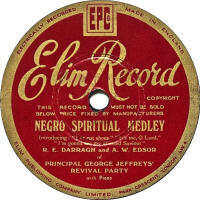 However, the records such as the one seen here are understood to date from the 1950s and it may be that they were pressed by EMI. The 10" discs had an E-100 catalogue series and 12" were in the E-500 range, but it is not known how many different ones were issued. The organist and composer, Francis Jackson, who is the performer on most of the records, was the incumbant organist at York Minster at the time. 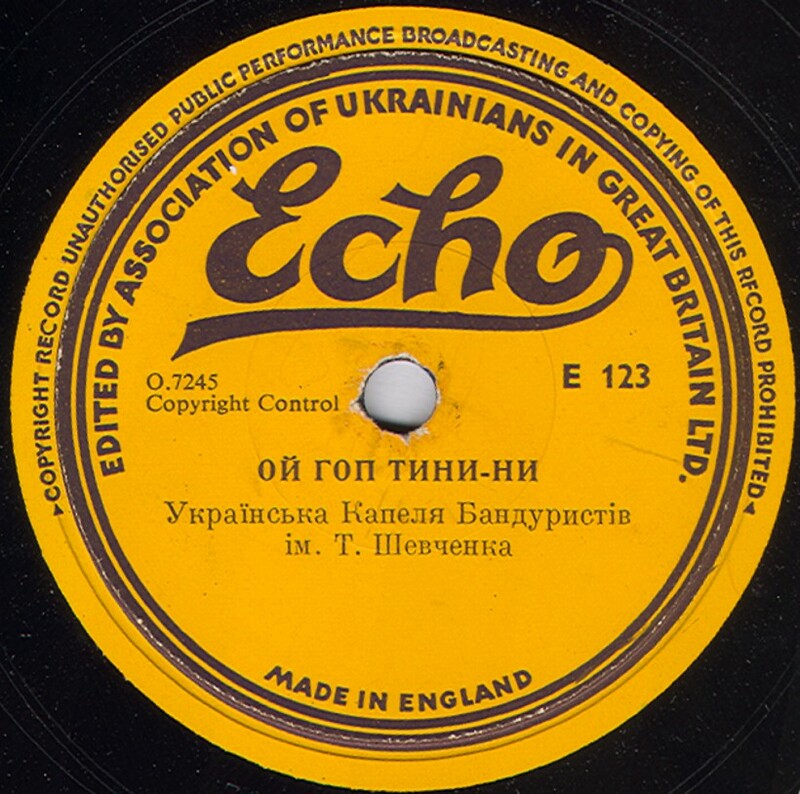 Echo These were 10" records prodcued in the mid-1950s for the Association of Ukranians in Great Britain. 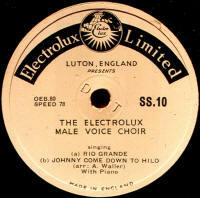 They were made by Levy's Oriole Records Ltd with a catalogue in the E-100 series. 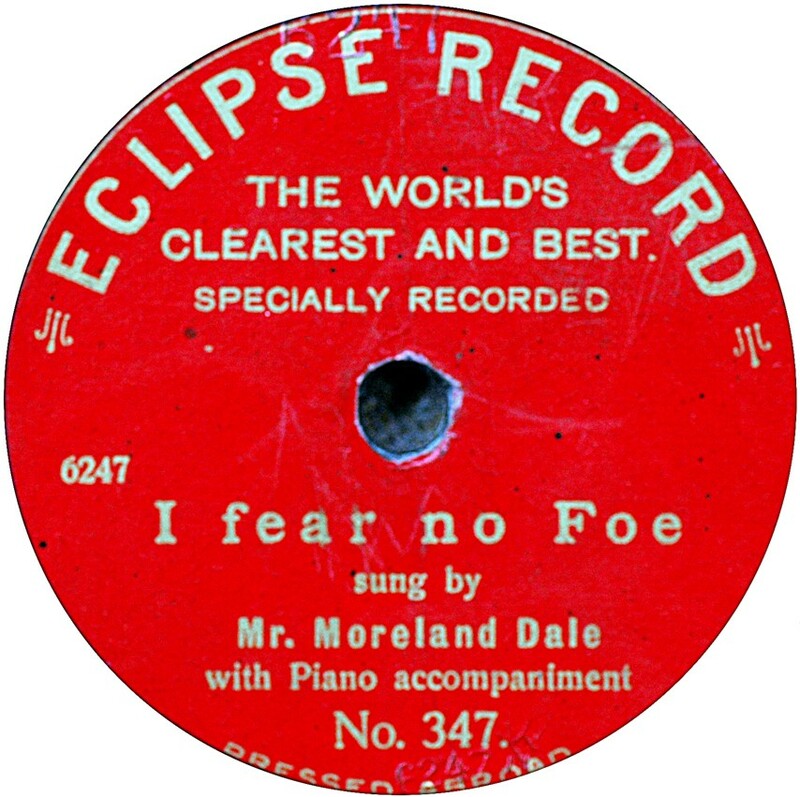 The first Eclipse record dates from just before WWI. It was manufactured in Germany for the British market. They are very rare, but obviously had ceased to exist on the outbreak of WWI in 1914. 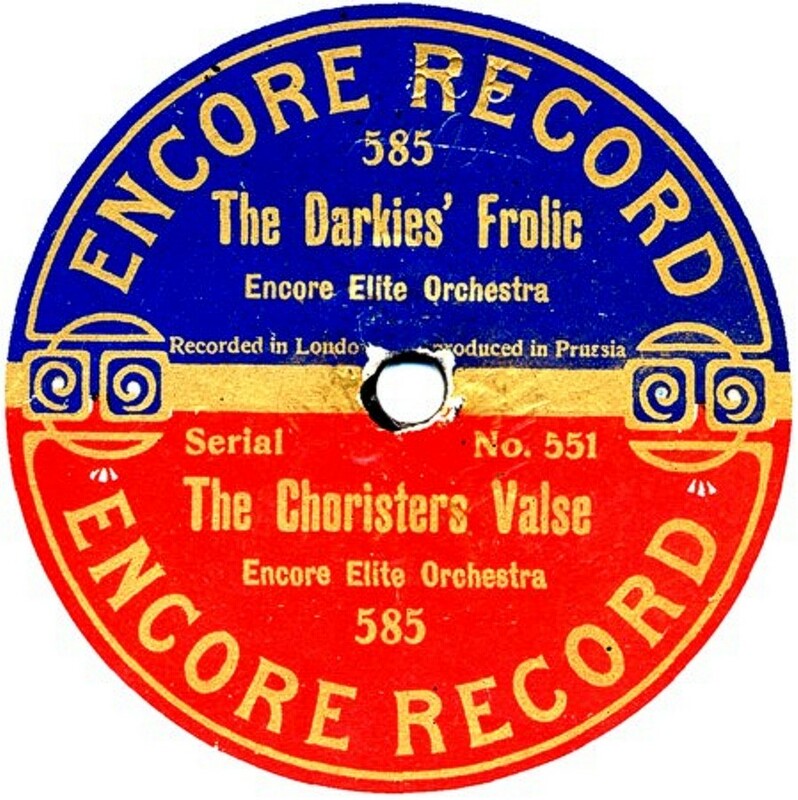 It is not known for who these records were made, but it is thought they were pressed by Globophon in Germany, using their own recordings, which have a 3-digit matrix number, and London recordings, which are in a 6000 series. The catalogue numbers may also be more than one series, with the 100- range being band and instrumental and the 300-range being vocal, but note a solitary 200- series in the listing just to make things difficult! 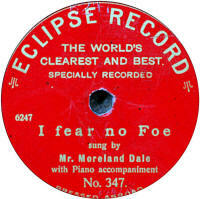 The very much more common 8" Eclipse record was launched in April 1931 and was available at only 6d from Woolworth's. The recording quality was good, as was the material. 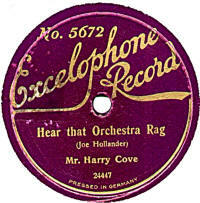 To keep the costs down, one side was usually a non-copyright song bought outright from the composer or publisher. All masters were English, and the catalogue started sensibly at 1 and ran to 1011 by July 1935 when they were discontinued. There was also a blue-labelled SC-1 series for more serious music, which ran up to SC-160. 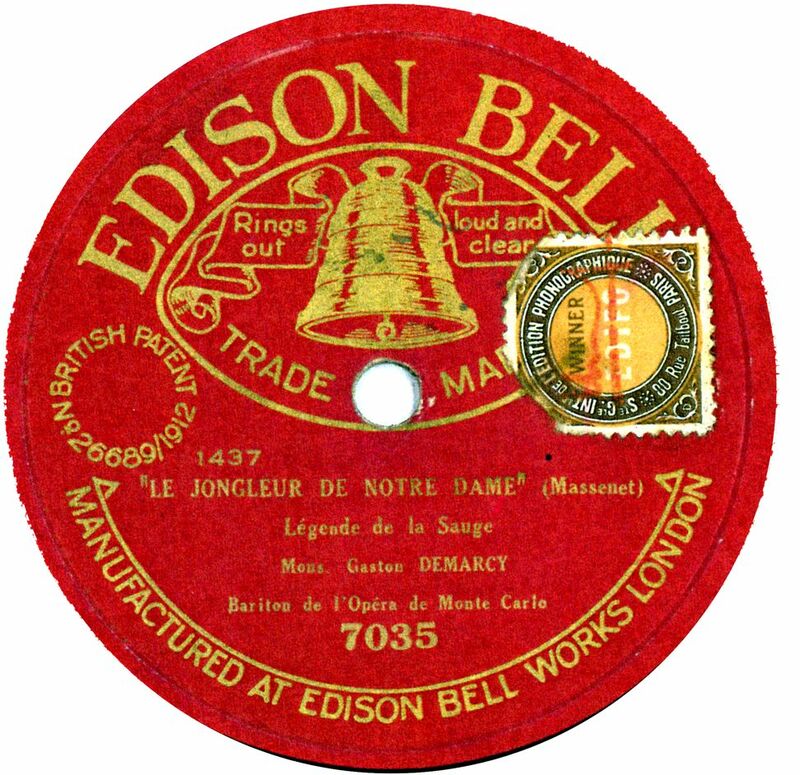 Edison The original recording company in the United States, set up by Thomas Edison, started manufacturing discs in 1913. Known as "Diamond Discs" they were ¼" thick and had a fine vertical cut groove. These were also imported on the UK from August 1922; the imports recognisable by the publisher's copyright stamp found attached to the label (see example, right). 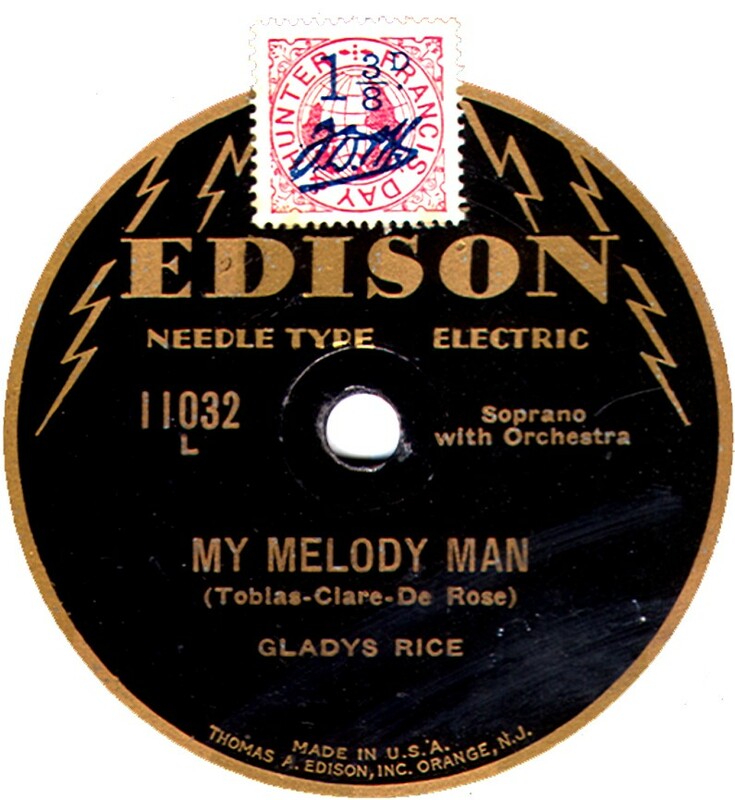 In the summer of 1929, the Edison company started producing standard lateral cut grooved records and it appears these were also imported into the UK, though only one known example has turned up in recent years. 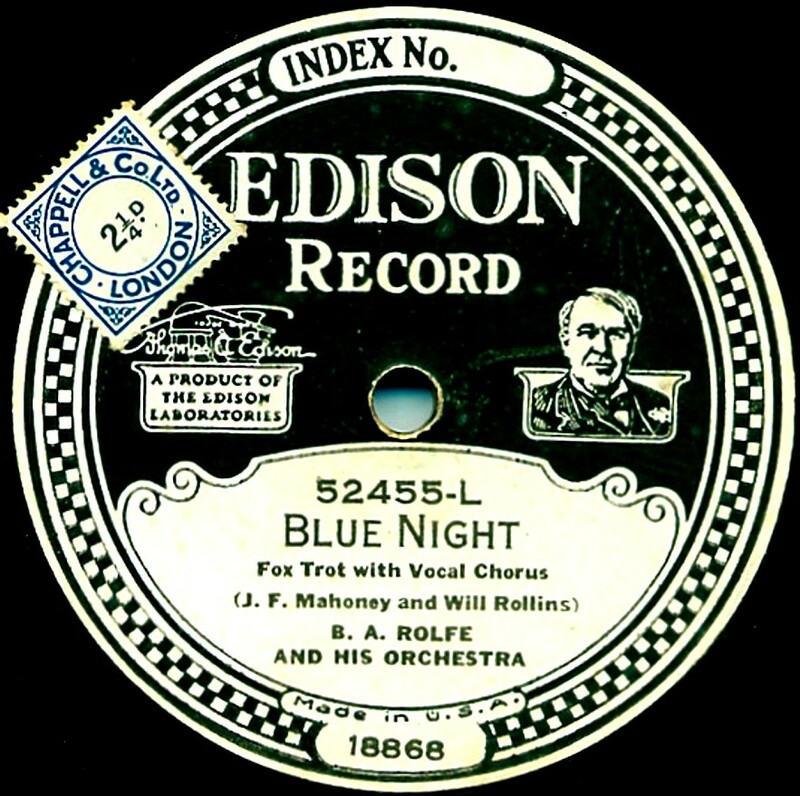 The Edison company ceased production in October 1929. The popular (50000) series were sold at 5/6 and the standard (80000) series were 8/6. The high price, combined with the fact you needed a special (and expensive) machine to play them has ensuree that they remained rare. The laterals were a cheaper at about 3/6, but still expensive: about the same price as an HMV record, but without the prestigious named artists. Thanks to Bill Dean-Myatt for the scan of the Edison lateral. 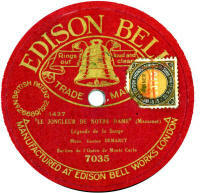 Edison Bell The first image shows a Brtish pressing of an export Edison Bell product, which is effectively a "Winner" but the label is just "Edison Bell" hence its incluion here. Thanks to Bill Dean-Myatt for the scan of the label. 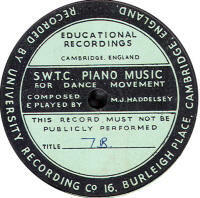 The second image is of an interesting historic recording. 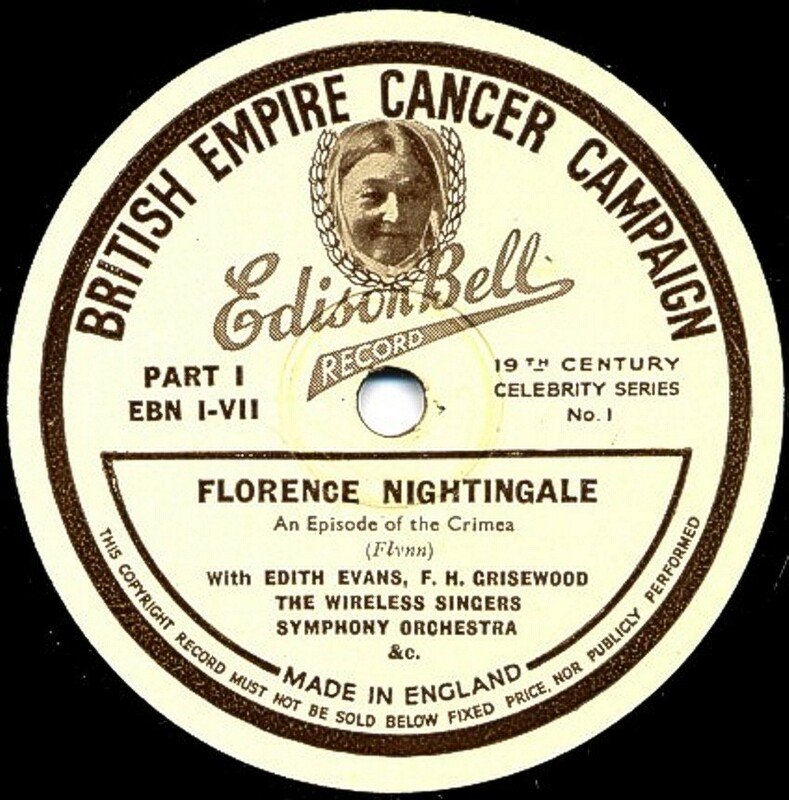 Apart from all the build-up about Florence Nightingale, the record concludes with a dubbing of Nightingale's own voice, taken from a very much earlier recording (she died in 1910; this record dates from the early 1930s). The words she speaks are quoted on the sleeve (see photo). 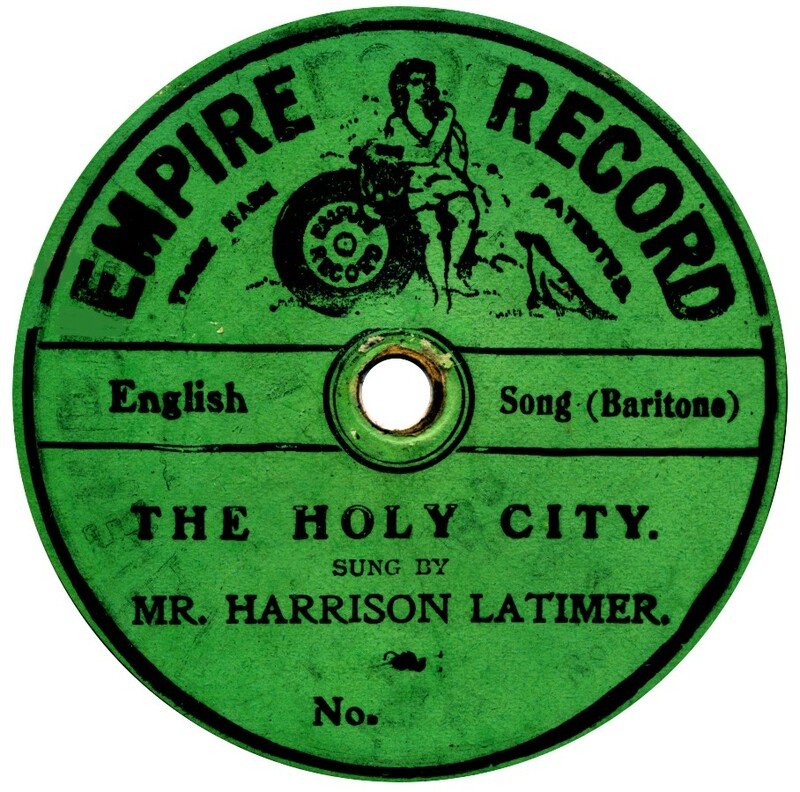 The label describes the record as "19th century celebrity series No 1". As far as I am aware, this was the first and only issue in this series! 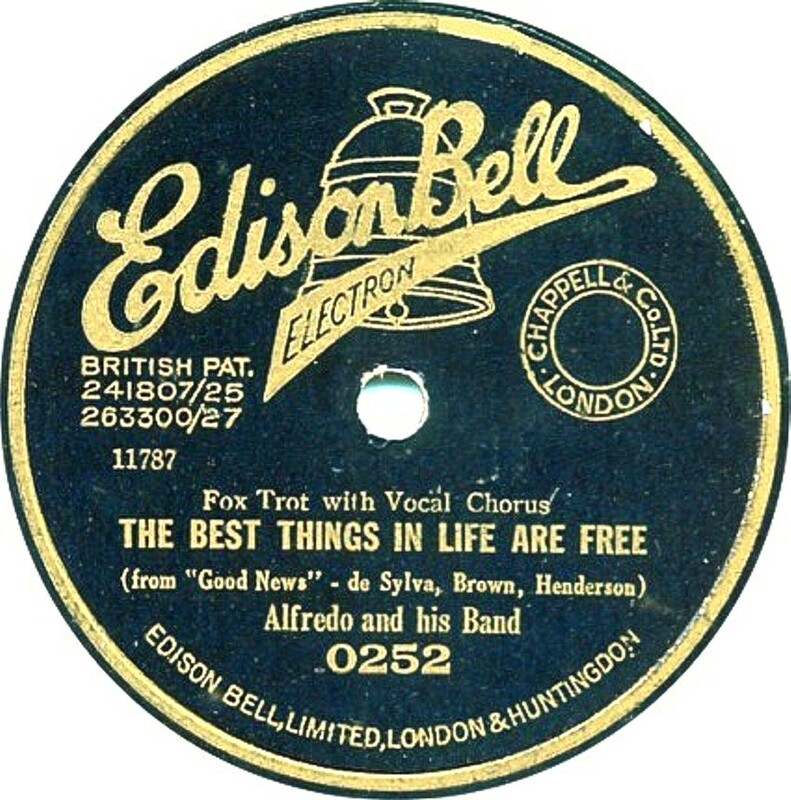 Note: The records issued as "Edison Bell Electron", "Edison Bell Radio", "Edison Bell Velvet Face" and "Edison Bell Winner" will be found under Electron, Radio, Velvet Face and Winner respectively. Educational I think these are likely to be privately produced records, by the University Recording Company of Cambridge. 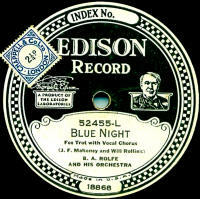 Electric Another rare pre-WWI disc record using the latest "buzzword" as it's name. They were not electrically recorded, of course. Electrolux There were only two different records with this name, both made by EMI in 1949 & 1950. They were numbered SS-10 and SS-13 respectively and were prodcuted for presentation to the Electrolux company's dealers and agents at Christmas in those two years. 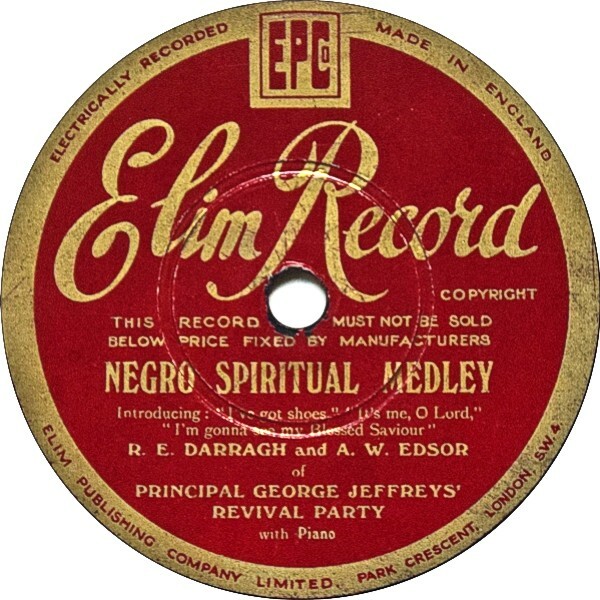 Electron Electron records were a superior product from J. E. Hough's Edison Bell company, to replace the (mainly) acoustically recorded "Velvet Face" records. Electrons were all electric recordings and all British matrices. 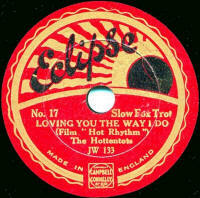 Their price means they did not sell well and are rarely found today, compared with Winner records. 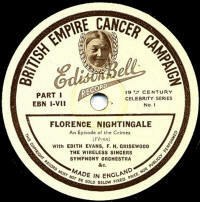 They were available from 1927 to 1929 and the catalogue ran from 0150 to 0303. A 12" series was also produced with an X-500 series catalogue. 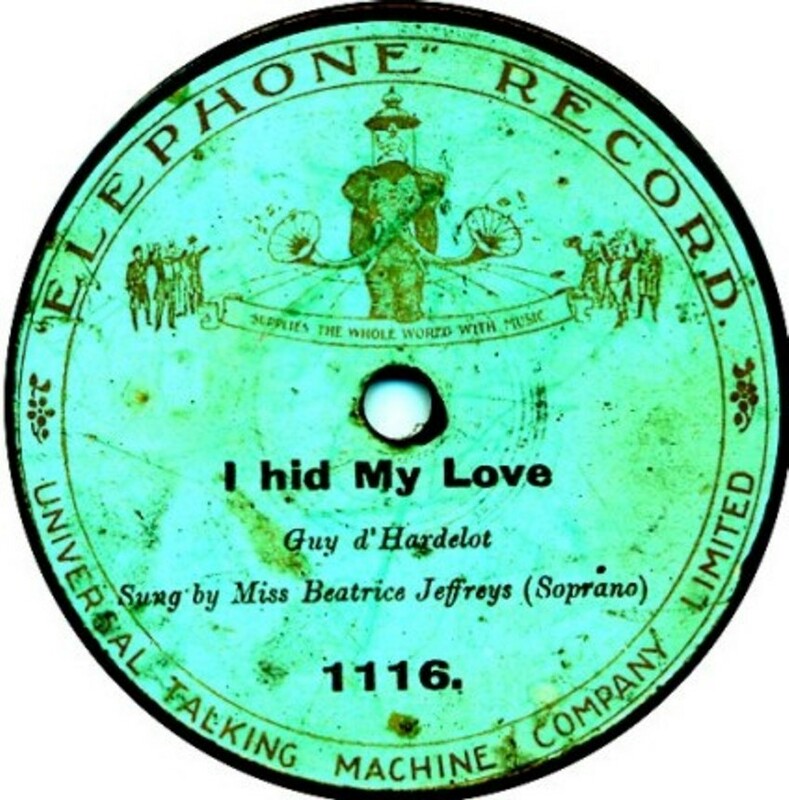 Elephone Elephone records were make by The Universal Talking Machine Company which was one of William Barraud's first forays into the early Gramophone record field. 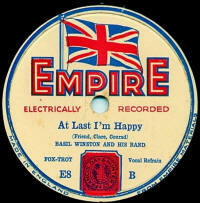 He was later involved in the Invicta record company which produced Invicta and Guardsman records. 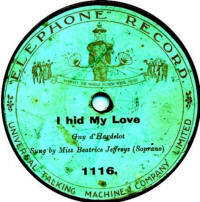 Elephone records date to about 1908-09 and were, I understand, made for exporting to India and much of the material issued on the label was of Indian music. The fact they were exported from Britain explains why they are so hard to find here. Elim Manufactured by Crystalate/Vocalion, Elim records date from the early 1930s, with a label design very reminiscent of the "Broadcast 12 Super" label and with masters in a CP (Crystalate Private) series and catalogue numbers starting at E-1. I suspect the label was quite short-lived. 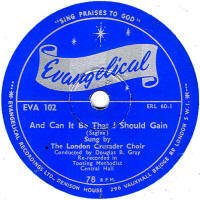 All Elim records were of a religious nature and were produced on behalf of The Elim Publishing Company Ltd. of Park Crescent , London SW 4. 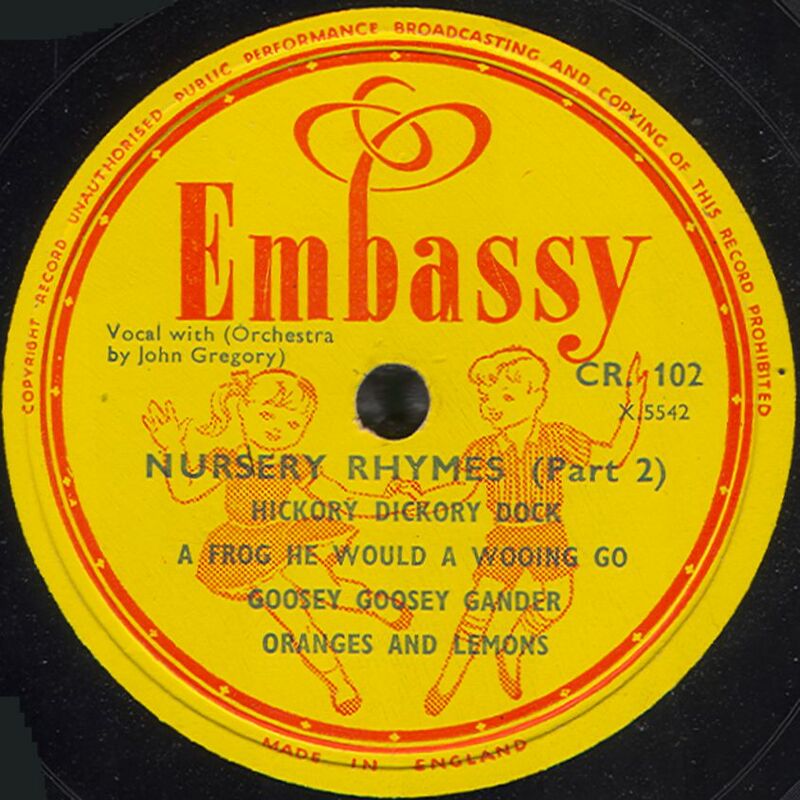 Embassy After a break of about 20 years following the last "Crown" record, Embassy was the next Woolworths-only record and appeared first in 1954 and cost 4/6. 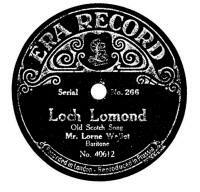 They were recorded by Levy's Oriole Company at their studios in 73 Bond Street, London and pressed at the Oriole factory in Aylesbury, Bucks. 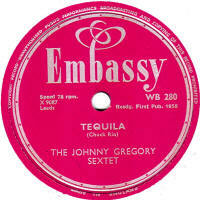 Embassy records provided high-quality cover recordings of popular chart hits. 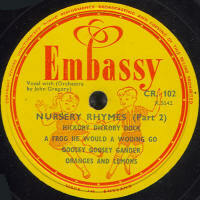 It is said that sometimes The Embassy issue appeared in the shops before the original was released. If this did happen, it would have been an American hit awaiting release in Britian. Some Embassy cover versions outsold the originals: Maureen Evans' version of Stupid Cupid on Embassy outsold the Connie Francis original on MGM, and sales were generally very high, which may be why Embassy record sales became excluded from the published chart "Top 20". 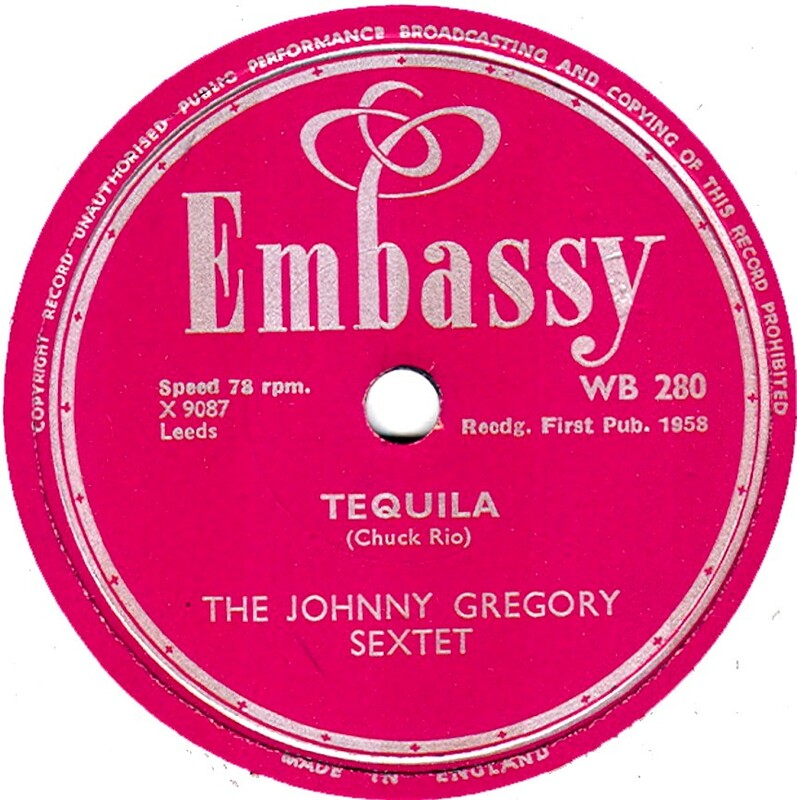 The last 78s probably date from 1961 and Embassy continued at 45rpm (and as LPs) until 1965 when Oriole was taken over by CBS. Empire There were at least 6 different Empire records in Britain at various times, three from the pre-1920 era and three from the 1930s. 2. The second appeared in 1911 and used Dacapo masters (Pic 2). 3. 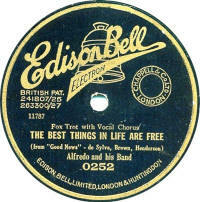 The next was actually called New Empire and was a Edison Bell product (the purple one shown here). 4. The colourful one pictured here was a Piccadilly subsidiary, appearing briefly in 1931, with a catalogue running from E-1 to E-12. 6. 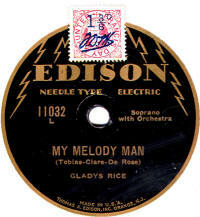 Finally another shellac, a subsidiary of Octacros, produced for Metropolitan Stores during 1936-37, with an E-100 catalogue series (the red one here). Footnote:- I believe that the name "Empire Recored" was also used on a "paste-over" label in the WWI period, but I have no examples and no further information as to what was being sold off in this manner. 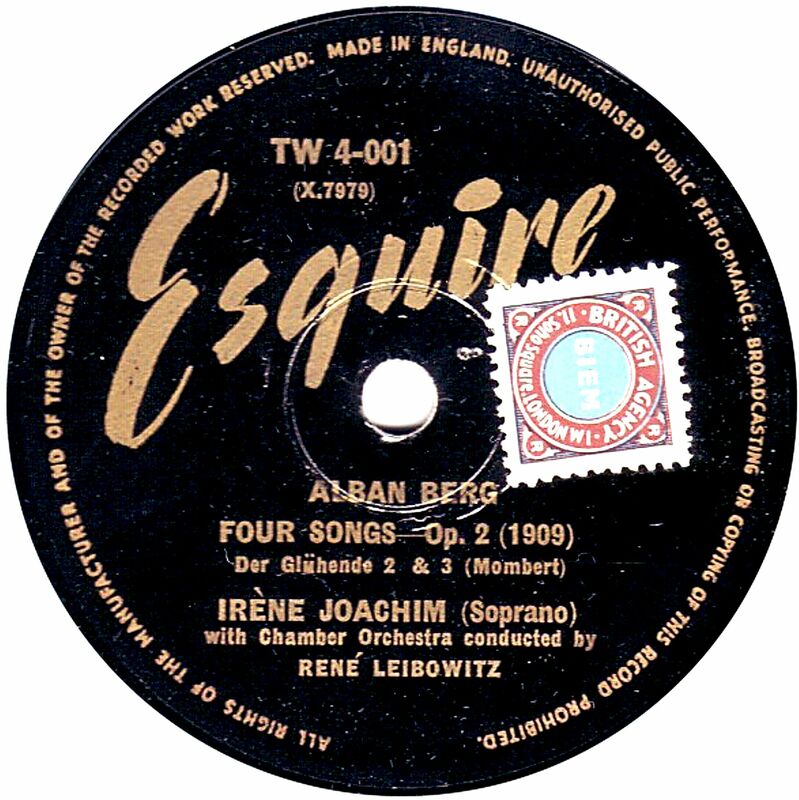 Encore This was a pre-WWI Beka product, pressed in Germany (where it was marketed under the name of "Veni-Vidi-Vici"). 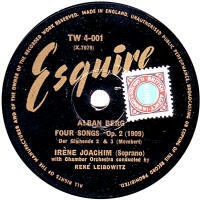 The record's feature was two titles each side, rather like the later "4 in 1" disc. Unlike "4 in 1", though, Encore still only played for the normal 3 minutes or so, so each title was only about half as long as usual. 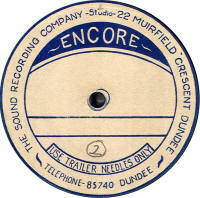 Encore (Private) A label from The Sound Recording Company of Dundee; date unknown, but this example is obviously an acetate, or at least has an aluminium base. Era Originally a Beka product made in Germany prior to WWI with a very artistic colourful design. These date from about 1907 and were all single-sided and cost 2/-, although in his writings in "Hillandale News No. 231" Frank Andrews reports that both single and double sided versions of this label were issued, the double sided ones costing 3/-, with catalogue numbers matching the usual Beka label issues. This label is quite scarce, and I've never seen a double sided one of this design. Frank reports that they were never advertised in the trade journals of the time. Era was a registered trade mark of William R. Petty, a watchmaker, of The Poplars, Bowes Rd, New Southgate, Middx, as from October 1907. 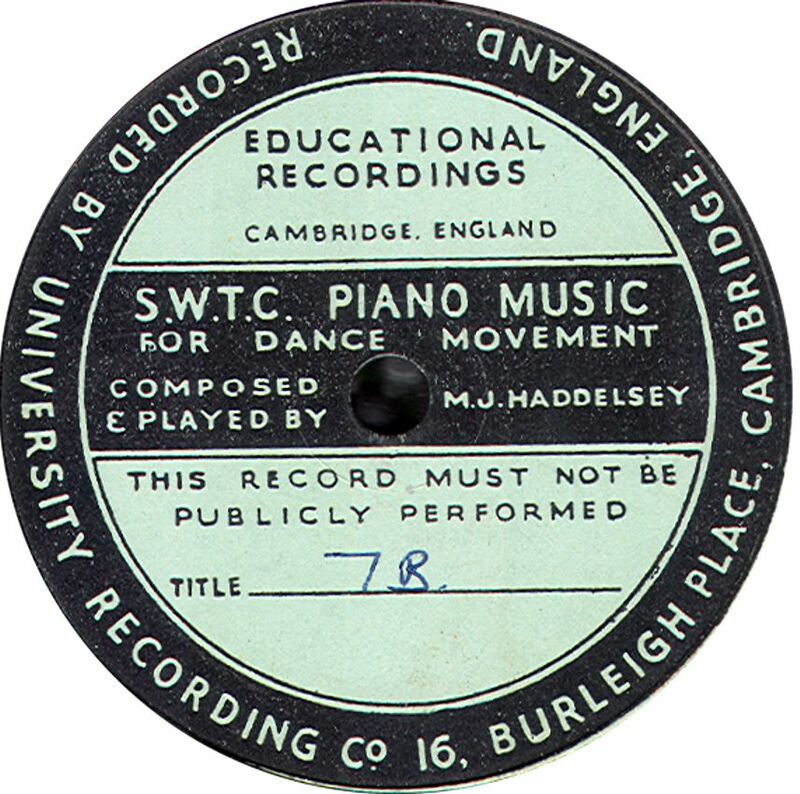 He registered the name to cover talking machines and disc records, with the design shown on the label here as the trade mark. 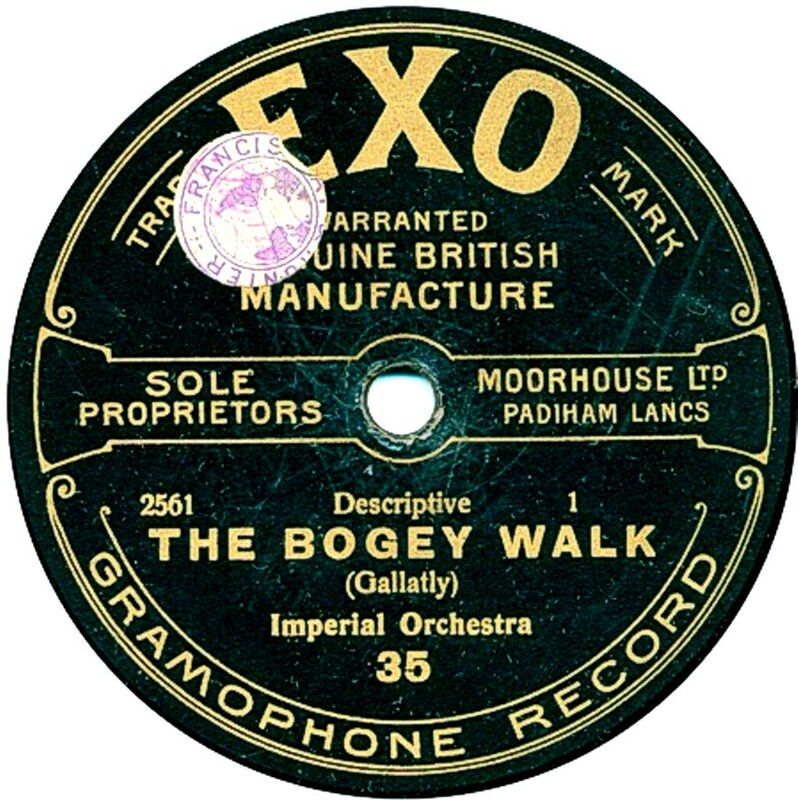 However, Frank was unable to find any link betweek Petty and those who were known to sell these records, which were The New Polyphon Supply Co, Barnet Samuel & Sons & John G Murdoch & Co. All in all, there is some mystery still behind this rare and early label. Subsequently (in 1910), Beka became part of the Carl Lindström group, and with it the Era matrices. 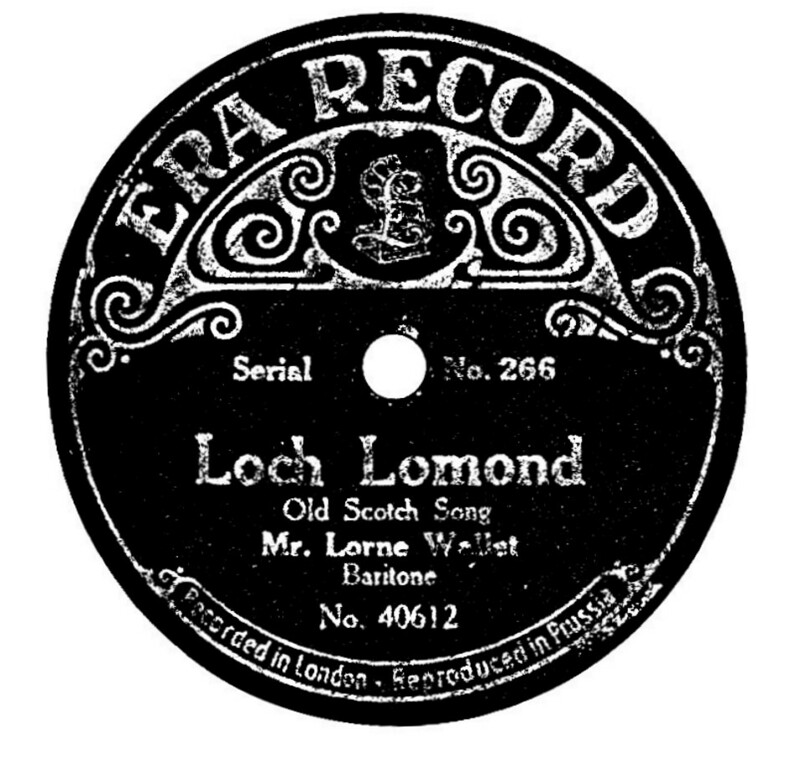 In March 1911, they issued a new Era label, not using Petty's trade mark, but with a new, simpler design incorporated the "£" ( 'L' for Lindström) symbol later associated in Britian with Parlophone (which was part of the Lindström group of companies. These were double-sided records, with the catalogue number still matching the parent Beka issue. (See second example). Thanks to Bill Dean-Myatt for providing the first label photo. 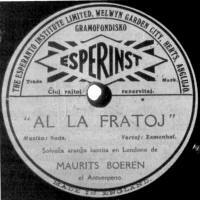 The monochrome image of the Lindström Era is from Rainer Lotz; This is the only image he has located so far, despite extensive research into German labels. I would wecome a colour scan. 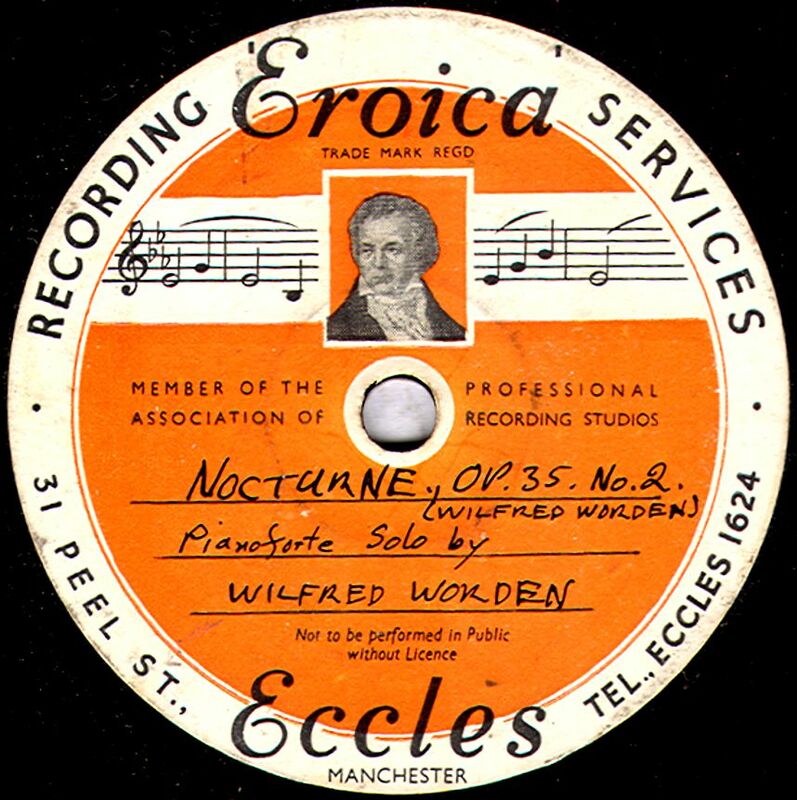 Eroica This was the label from the Eccles Recordings Services company, based in Eccles, west of Manchester. 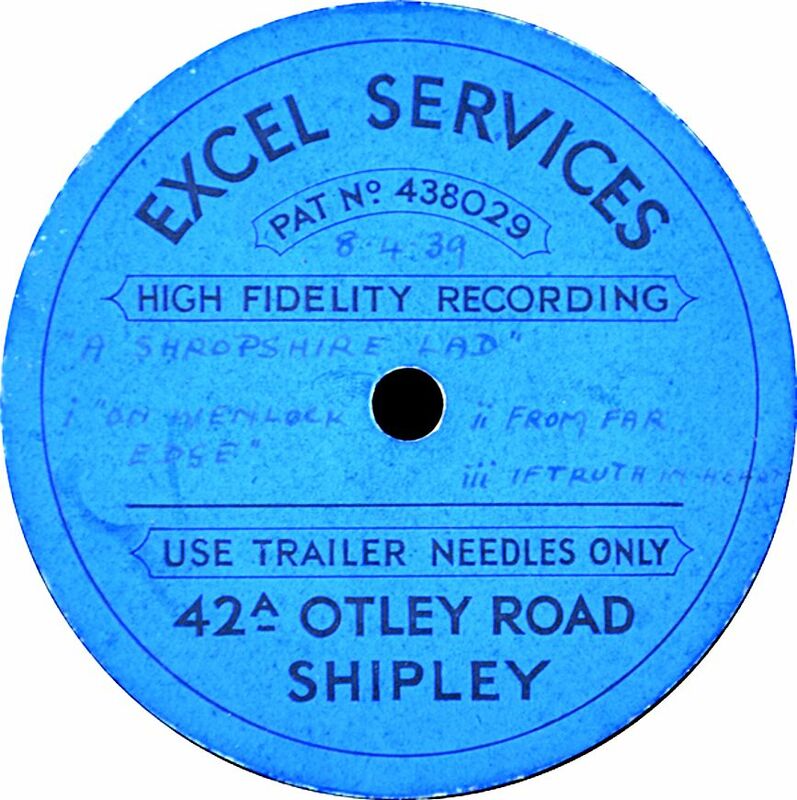 I would think that the one shown here is an acetate, but, as with many private studios, they would offer the services of properly pressed records, in small quantities, for a price. I've no idea of the date, but most likely post-WWII. 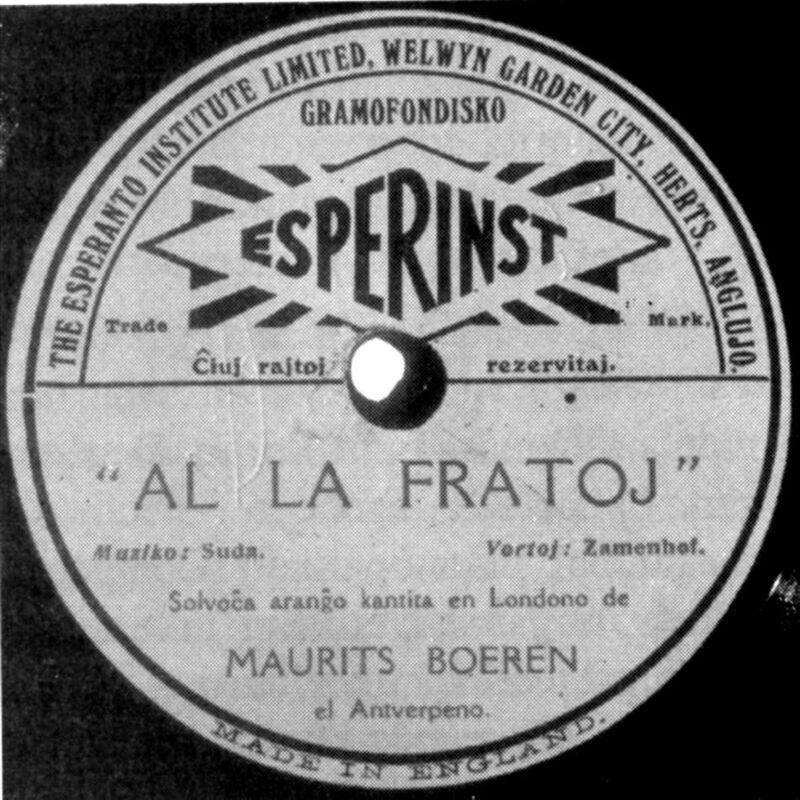 Esperinst These records were manufactured in 1926 by Crystalate on behalf on The Esperanto Institute Ltd, to publicise the international language. The example shown is a 10" record and it has no numbers on the label at all, which makes me wonder if it wasn't a one-off solitary issue. The matrix number of the one shown here is 4431. The Crystalate ledgers show only two other sides which were for Esperanto at this period, 4430 & 4432,. Maybe only one disc was issued? 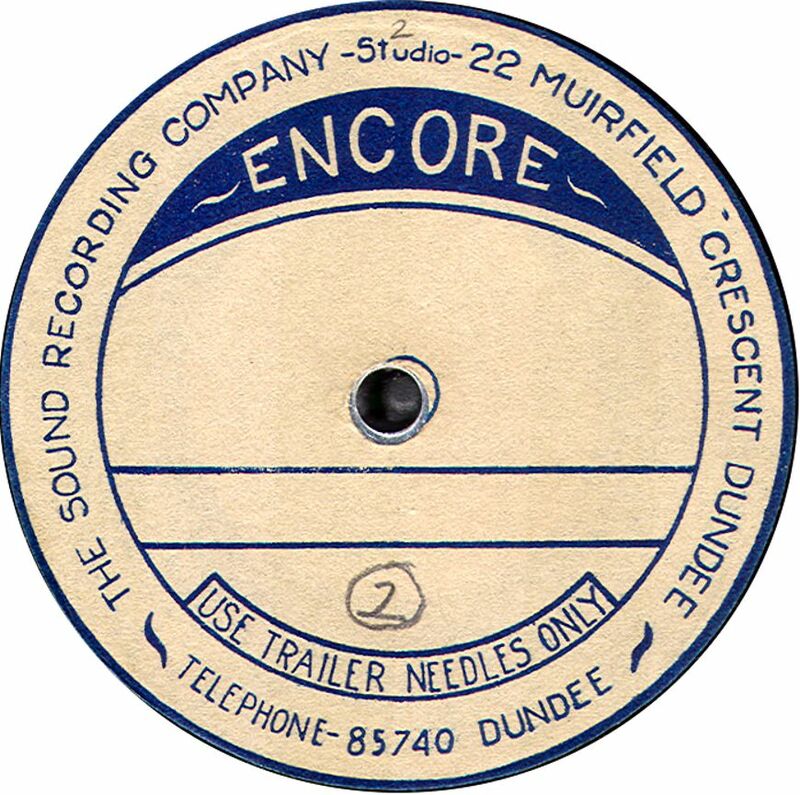 These recordings would be acoustically made, as Crystalate hadn't yet adopted the new electrical recording system. A colour label image would be gratefully received. 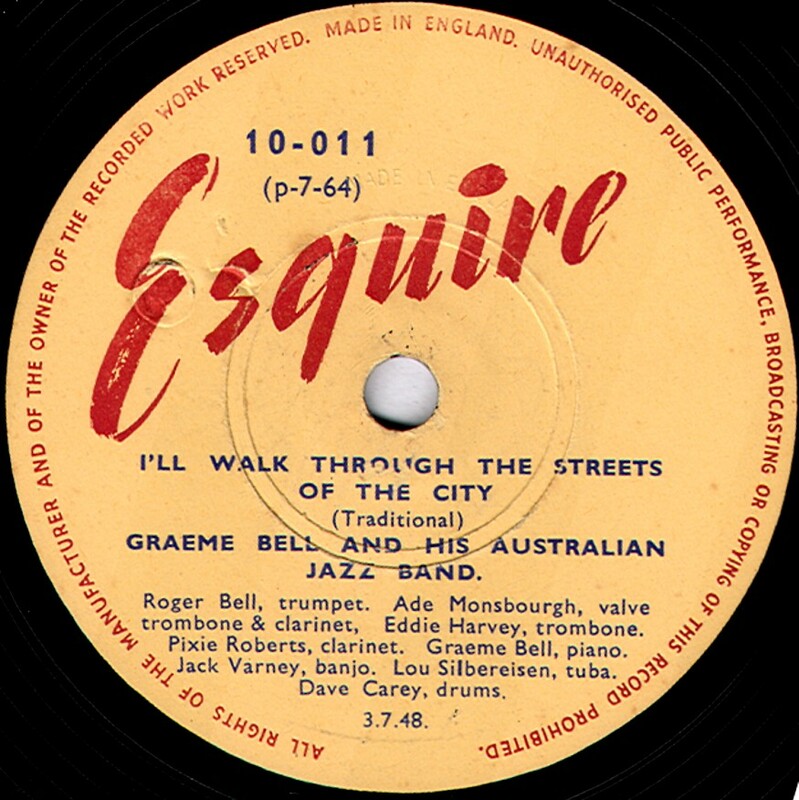 Esquire A well-known jazz label from the post-WWII period, Esquire records first appeared in February 1948 and issued new recordings (sometimes pirated, I believe) of jazz bands of all then-current styles from Britain, America, Australia & France. British drummer Carlo Krahmer was the driving force behind the label, which made many recordings not issued initially on 78s but were made available later on vinyl LPs. Esquire records could be obtained from many jazz societies and dealers, the records cost 5/9 for 10" records and 7/3 for 12". While Esquire concentrated mainly on jazz, there were other series. 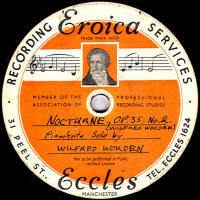 Thanks to Peter Adamson, I can show an image of one of the fairly scarce Esquire black labelled 12" classical series. These were expensive at 11/6 each! Evangelical According to the label, Evangelical Recordings were located at Denison House, 296, Vauxhall Bridge Road, London SW.1. 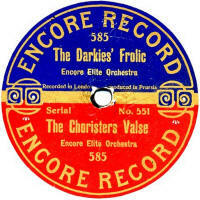 From the style of the label, I would say these records date from the mid-to-late 1950s. Excelda These were produced by Edison Bell from about 1912 onwards for Bornand Freres of Devonshire Square, Bishopsgate, London. Based on the known issues, it would appear that the catalogue ran from No. 301 to the 340s. They may even have all been issued in one lot. Certainly, judging by their scarcity, they were probably not on sale for very long. Excelophone This was a British label marketed in Australia. The records all date from around WWI and were made for J. G. Murdoch & Co (London). Several companies were involved in providing the masters, including Edison Bell, Invicta/Guardsman and Pilot/Polyphon as well. The example shown here is from Polyphon or Pilot. Frank Andrews reports different series of catalogue numbers: a 2000- series for the Edison Bell ones, a 5000 and 8000 series for the Polyphons and a 3-digit catalogue number for the Invicta/Guardsman ones, though some of the latter have no catalogue numbers at all. These catalogue series sound very like the ones used on the source labels, but the few I have been able to check don't match this, so i is just a coincidence, it seems. The basic design was similar for all, though some are believed to be just pasted over "Guardsman" records. 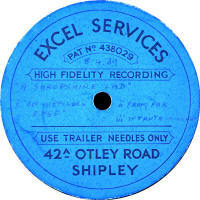 Excel Services Thanks to Bill Dean-Myatt for providing the label image. 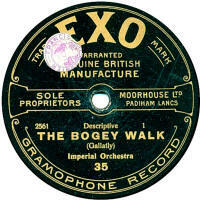 Exo This is a "shop" label, sold by Moorhouse's of Padiham, Lancs. 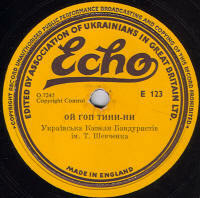 The style shown here is stencilled from a "Bell" record, but some issues were from Beka masters and usually sported a quite highly coloured label.